The Joan Hamburg Show on WOR Radio 710 raved about the merits of Second Chance Toys on their program dedicated to Green Living. 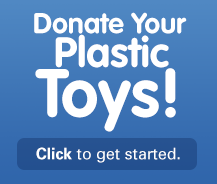 While Sasha was at field hockey practice, her mom called into the show and explained how Sasha started the organization to rescue, refurbish and recycle plastic toys. During the commercial break, Emme who was sitting in for Joan Hamburg must have gone onto the SCT website because once back on air, she was so excited about the mission of the organization and urged people who wanted to donate toys or start chapters to go to our website.